Restaurant Review: Is Panamericana Worth Going To Sentosa For? Fifteen minutes later and our driver had only exited ECP to get on the MCE towards Harbourfront. It usually takes ten, we grumbled internally, obviously cranky by our rumbling tummies, as the vehicle zipped through our pretty smooth expressways to new bar-grill destination Panamericana, located in Sentosa. In Singapore, traversing across a single expressway may taken an hour or less. And for the world’s longest road aka Pan American Highway, it’ll take a causal three months to get from Alaska to Argentina; that is if you’re on the road for an average of eight hours a day. While embarking on such a road trip is rather unfathomable, the 50,000 km-long superhighway and the diverse cultures it brings adventurous travellers to have inspired and birthed Panamericana, where we daresay getting to is quite an expedition on its own. 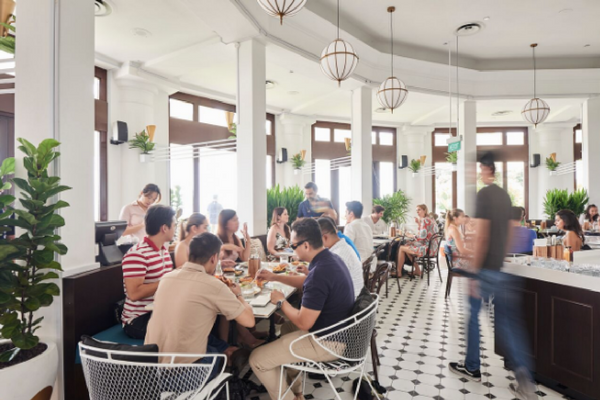 Drenched in sunlight, the bar-grill destination is synonymous to a resort hideout, where you’ll find leafy plants and colonial-chic accents punctuating the massive space that opens up to soothing ocean views. The real standout is the commanding Argentinean barbecue pit called asador, where meats, still in their recognisable forms, are slowly cooked over a dancing fire. The latter indicates the restaurant’s prided ‘fire-to-table’ direction, clearly hinting that we’re on a highway to gastronomic heaven. Like its name suggests, Panamericana offers the culinary spoils, presented in small and big plates, from the Americas that the iconic expressway passes through. So expect a mishmash of all sorts of food that can satisfy the conflicting cravings from large groups. 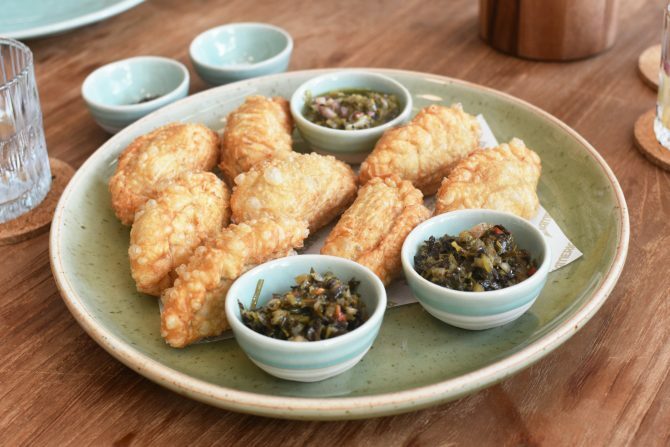 Start off with the Empanadas ($8), a Spanish pastry that we mistook for our local curry puff – a mistake we hoped we can be forgiven due to its similar cocoon shape and the familiar components of potatoes made spicy with harissa. However, it was the lashings of pulled lamb meat that insisted on its origins which we regarded by inhaling the yummy pastry quickly. The Corn ($12), rubbed with chilli citrus salt and cheesy manchego shavings, is also a delicious option to kick-start your culinary road trip. We unapologetically gnawed ours with gusto. Panamericana is big on salads, with each offering substantial enough to be a meal on its own. Order the Rio ($14) that comprises slices of beetroot, cherry tomatoes and the uncommon heart of palms for texture, or the refreshing British Columbia ($14), featuring an illness-fighting mix of fennel, apple, beetroot, red cabbage and birdseeds. Grilled, roasted and barbecued, the restaurant promptly demonstrated its ‘fire-to-table’ philosophy with asador-prepared dishes, namely: the rosemary and thyme-glazed Lamb ($45) and flame-licked Rib Eye ($42) that promptly quelled our insatiable bloodlust. 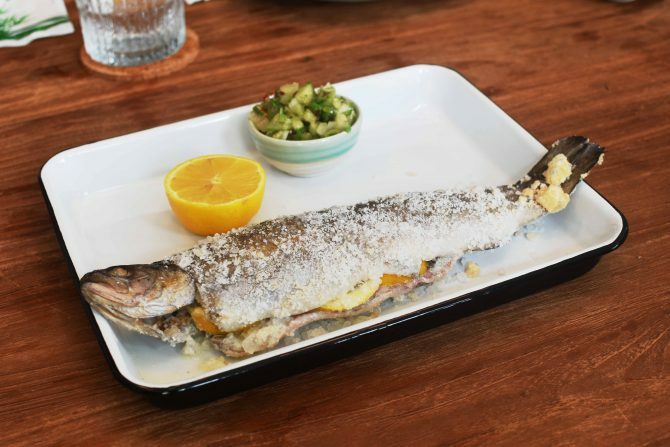 However, it was the ocean delight of the salt-baked Trout ($40) that emerged the dark horse out of the three. Cracking open its salt crust reveals the trout’s tender pink flesh, zing-ed with a tangy tomatillo salse verde – an excellent showmanship of culinary techniques, we say. And just like how the iconic highway has inspired the restaurant’s melting pot of diverse cuisines, the stretch of man-made marvel did the same for its slew of invigorating cocktails. 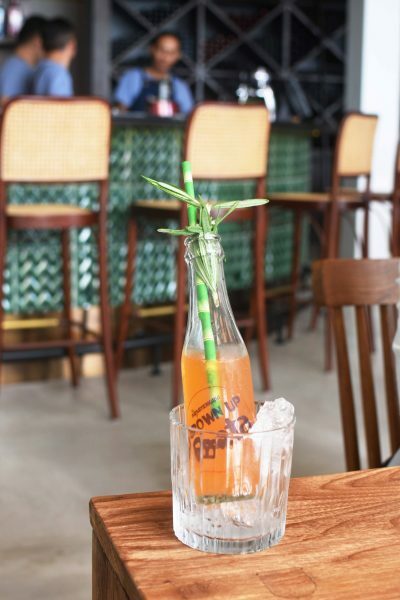 From the soothing Panamericana Sangari ($18) of pisco, sauvignon blanc, Cointreau and fruits to the nostalgic Grown-Up Fanta ($18), a fizzy orange soda laced with Aperol and prosecco, there’s certainly one for everyone at the abode. So back to the question: Is Panamericana worth going to Sentosa for? If you’re looking for a respite without leaving the country, the destination surely hits the spot. Other than that, the food needs a bit more fine-tuning for a postal code that is out of the way.